3 Pc. Motorcycle Graphic kit. Available any reflective color or any stock vinyl color Fender art measures 4 1/2” wide by x 8 1/2” long. Side panel art measures 9 1/2 long x 2 1/2 wide, and you get two of these. You receive a total of 3 motorcycle graphic kit items. The picture to the right is the cut art from which your motorcycle graphic kit is made. These are individual graphics and are show in the inset in the photo to the right. We have other motorcycle graphic kits (s) coming soon! Please check back often. This motorcycle is equipped with several StreetGlo products. The featured motorcycle graphic kit is installed on the front fender, and the storage/ trim boxes on each side of the motorcycle. In addition, our MegaFlame Helmet Decal Kit is installed on the helmet, and 1/8” and 1/4” matching LumaStripe pin stripe is also applied to the fenders, fuel tank and unseen from above, along the motorcycle frame. Add all of these items to your order for a complete night driving experience. During the day, it looks like ordinary and classy trim features, but at night LumaStripe helps command attention from those that may be in a position to hit you. This Motorcycle graphic kit installed on a Suzuki Volusia and will work on most Intruder and Boulevard models as well as many most cruiser style motorcycles. Available any reflective color or any stock vinyl color Longest and widest element is 7.75” long by 1.25” wide or slightly smaller dimensions for the smaller graphic elements. You receive a total of 8 motorcycle graphic elements for each side of each fender, front and rear. Use alone or combined with the 3 piece graphic set above. This motorcycle is equipped with several StreetGlo products. Fenders and Side Compartment— - Our 3 piece graphic set and our 8 piece graphic set. Body, 1 roll 1/4” and 1/8” reflective pin stripe. Note, only the tank and fender pin stripe can be seen during the day. The remaining pin strip is black on black and can be seen only at night. Ultimately Cool and Outrageously bright at night! Note: Factory reflectors were blocked out for this photo. These are individual motorcycle graphic elements, total of 8, and are installed on the front and rear fenders. 64 Pc. Big Flame Kit. 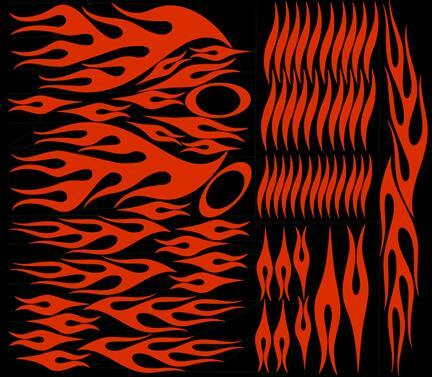 This motorcycle flame graphic kit is loaded with flame elements. This motorcycle graphic kit . 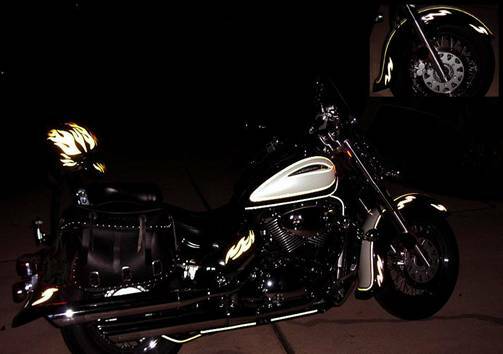 This kit is large enough for motorcycle tank flames and fender flames, and still cover the average helmet with stylish reflective flame graphics. 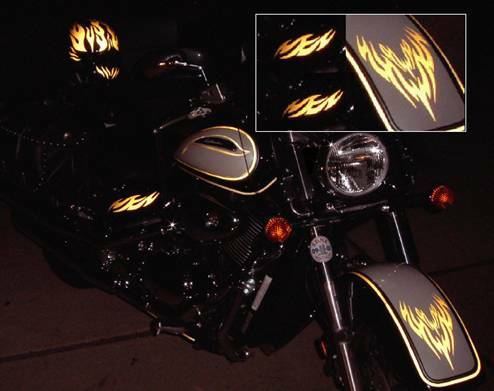 Order this motorcycle flame graphic kit in any Color. 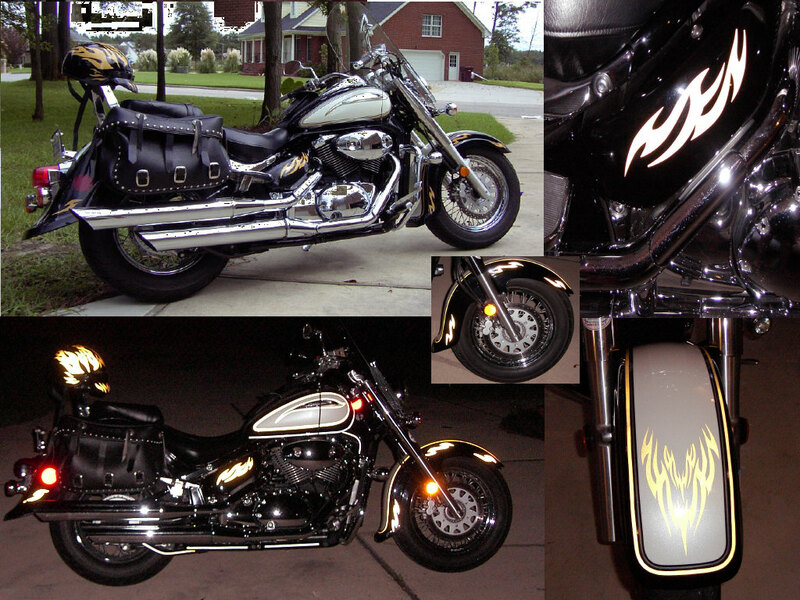 This is our largest motorcycle flame graphic kit and is bargain priced!. This motorcycle graphic flame kit includes flame elements similar to our classic flame kit and slender flame kit which are routinely installed on motorcycle helmets. All motorcycle graphic kit (s) are DIE cut, one color sticker / decals. If you see a background on the motorcycle graphic kit photo, this represents only the backing material. The Motorcycle graphic is pulled off the backing prior to installation. Our motorcycle graphic kit is easy to install. We use wet/dry vinyl allowing you to apply either totally dry or wet with a solution of 1 cup water and 1 drop of Palmolive dishwashing detergent. Some elements of this motorcycle graphic kit will be supplied with application tape to insure easy installation. The application tape is removed after the decal is placed.